We study the superfluidity of attractive binary mixtures of 6Li and 40K atoms (one-hyperfine state of each type of atom) in the presence of both spin- and mass-imbalance in a two-dimensional optical lattice. The polarization vs. temperature phase diagram is plotted assuming a single-band Hubbard model and considering the possibilities of the Fulde-Ferrel, Sarma and normal states. The stability of the system is analyzed using the Bethe-Salpeter equation for the collective excitation spectrum in the general random phase approximation. 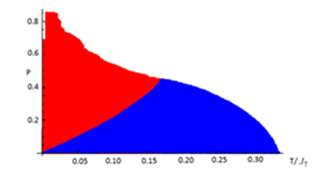 The numerical solution shows the existence of the Landau instability. This instability occurs when the collective mode energy reaches zero energy at an incommensurate quasimomentum.